Our expeller-pressed Sweet Almond Oil makes an excellent massage oil because it absorbs through our pores slowly. Almond Oil is a luxurious, non-greasy moisturizer that leaves your skin soft, silky and smooth. It is excellent for all skin types (unless you have a nut allergy). We add in some lavender essential oil, an aromatherapeutic treasure, to promote relaxation and natural healing for lungs, sinuses, and skin. 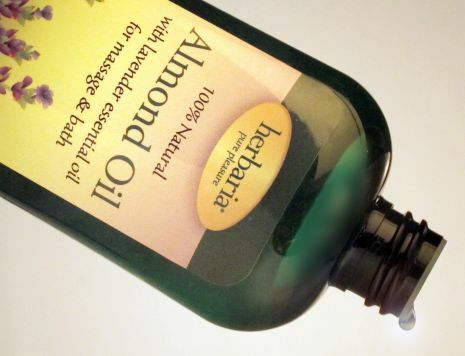 Float a few drops of Almond Oil in your bath. The warm water will gently vaporize the lavender essential oil. Lie back and breathe deeply. Store Almond Oil in a cool place. Compared to our Jojoba Oil, it has a shorter shelf life. That’s why we offer it in 2- and 4-ounce bottles. As you can see here, almond oil is clear. Check out Almond Oil Soaps and Products. Each bottle of Almond Oil counts as 1 bar toward our free bar offer.